LITECOIN & Crypto Markets Might Pull BacksteemCreated with Sketch. One of the things I tend to notice and point out is the divergence and convergence of RSI levels. 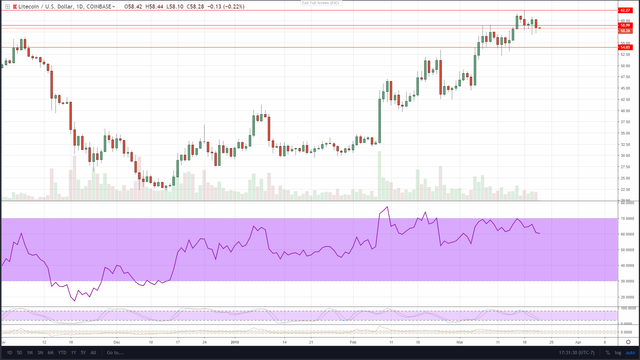 With LTC right now, we have seen daily RSI's hit highs, and pull back. The prices have continued to climb, causing a divergence. Since we're on the way up, this is likely meaning a pullback. Overall, I think this is good as it will let the weekly and longer charts establish support and prove a higher low, confirming a bull move. Volumes also seem to be coming down which means bull steam could be fading. If that happens, the buying will dry up and the bears will likely step in. At this point, we do need consolidation, but I don't know if I see it now in this shorter term.